Join the discussion on our forums! 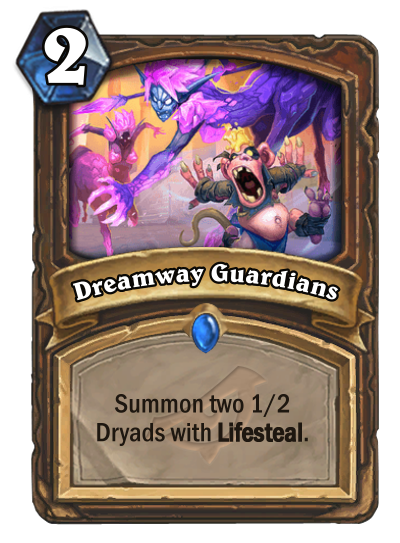 Come discuss Dreamway Guardians over in our dedicated Dreamway Guardians discussion topic. Fire Fly saw a lot of play and this card creates Fire Flies with Lifesteal. I assume the Dryads aren´t beasts? Another token druid card, last time they tried to push a Druid archetype it didn't work (token-hand druid). Let's see if token-heal druid works out. This seems more mid-range focused, rather than past token decks which where hyper-aggressive and had some unfair combos (turn 5 lethal anyone?). But does THIS version of token druid do anything stronger/better than other decks? Doesn't look like it so far.